Have you ever had the problem where you and your friends can't agree on what to do, because one group wants to go to an art exhibition, while the others would rather do something outside? If you happen to face this issue when in Stockholm, there's a compromise that you can all agree with – head to the Artipelag Art and Cultural Center. This newest spot on Stockholm's map of cultural events was opened just recently – June 3 – and has been designed to accommodate all sorts of events – sculptural, design, architectural, musical, etc. The museum has expansive exhibition halls and a separate 1200 m2 space specially made for Artbox events – musical performances, exhibitions and television tapings. Artipelag is situated about 20 km east of Stockholm, in Hålludden, on the island of Värmdö. You can get there in about half an hour by car or bus; a boat ride will take a bit longer. The owner and initiator of the new project is Bjorn Jakobsen, founder and head of the Swedish company Baby Björn AB. Jakobsen began developing his vision for the creation of a modern art center that would lie outside of Stockholm's city center back in 2000. The selected site in Hålludden is a real treat for nature lovers – it's surrounded by forest and lies on a picturesque harbor with clear air and seaside cliffs. Architect Johan Nyrén (1947-2011) designed the project that the building was based on, which maximized the use of local and natural materials – concrete, glass, and black tarred pine. A slope adjacent to the building leads up to the museum's roof, from which opens up a wonderful view of the surrounding area, now outfitted with walking trails and boardwalks. 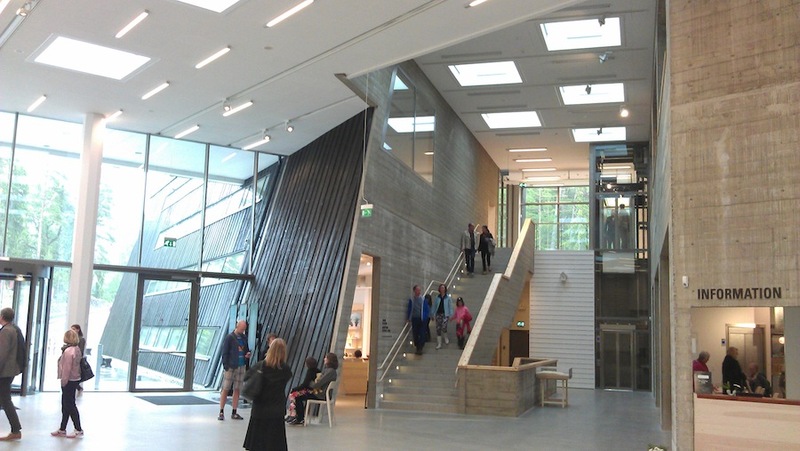 Unlike other private museums, Artipelag will offer its visitors not only exhibitions of its private collections, but will also cover the latest issues pertaining to today's art, design and architecture. Artipelag also has spaces designated for theater productions and concerts, as well as several conference rooms. Artipelagk's first show, which opened June 3, is called Platsens själ (“The Souls of Places”), or as written in the exhibition's description – “Genius Loci”, which connects this place with ancient Rome. In the ancient world, Genius Loci was the protective spirit, or genius, that takes care of a place's distinctive atmosphere. Philosopher's and architects use this Latin phrase to describe the uniqueness of a location. 16 contemporary artists take part in the exhibition Platsens själ, showcasing their paintings, photographs, sculptures, videos, installations and mixed media works. Alongside these works from today, the exhibition's organizers have displayed paintings and photographs that already have a history – pieces from Stockholm's City Art Museum, the Modern Art Museum and other collections. This historical part of the exhibition takes a look at “the city” (such as the “immortal” city of Rome or historical Stockholm) as a place that, over the centuries, unifies its inhabitants with a collective soul. “The Souls of Places” will be open through September 30. Bo Nilson is the artistic director of Artipelag, having previously managed the Liljevalhas art gallery and curated at the Louisiana Museum of Modern Art (Denmark). On June 30, works by the well-known German photographer Candida Höfer will be put on exhibit at Artipelag. Artipelag also houses two restaurants. One is on the first floor and features an expansive Swedish smörgåsbord, while the other is on the second floor and has tables both inside and out on the terrace, with a fabulous view of the harbor.